Newly (re-)described species of beaked whale! 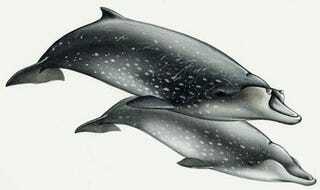 An in press article identifies Mesoplodon hotaula as a new species of beaked whale. Again. Beaked whales are a misnomer: they have a snout that's labeled a beak, but that's not really a beak in any sense. Beaked whales, or ziphiids, deserve a better, or at least a more accurate, name. Beaked whales are ~21 species of odontocetes (toothed whales) and share a relatively recent (less than 30 million years is recent-ish) common ancestor with dolphins. Beaked whales are neat for being sexually dimorphic (having distinct female and male morphologies) in their dentition; whereas females are completely toothless, males in all but one species have only one or two pairs of teeth. Beaked whales are moderate in size for whales, being larger than most dolphins and smaller than the largest toothed whales (sperm whales) and the largest baleen whales (such as the sperm whale). They are also the whales that no one goes on whale-watching trips for. They are deep-diving animals, seeking prey items hundreds of meters of depth underwater. They don't appear to be abundant in population, although some species have never been seen in the wild. Those species have only been identified off dead, or dying, individuals washed up on the shore. That last part makes them fairly difficult to study and can create some taxonomic problems. A researcher named Deraniyagala first named Mesoplodon hotaula in 1963. A specimen washed ashore in Sri Lanka, Deraniyagala described it as a distinct species, but didn't do much to provide evidence for why it was distinct. Two years later, two other researchers considered M. hotaula as a junior synonym (an unnecessary redundant name) for an already named species, and sank the name. Since then, researchers have been making some noise about resurrecting the species name, but this new study is the most concrete work to do so. The in press article by Dalebout et al. looked at seven specimens of M. hotaula found in the Democratic Socialist Republic of Sri Lanka, the Republic of Kiribati, the Line Islands, the Republic of Maldives, and the Republic of Seychelles. Most of these specimens had skeletal tissue still preserved, while one was only dried soft tissue. From this tissue they were able to compare the morphology and genetic information of these specimens with already published and new information from other, already-recognized, species of Mesoplodon. The evidence supports fifteen distinct genetic lineages within Mesoplodon, all of which are currently identified as species. This discovery brings the total number of Mesoplodon species to 15, making it, by far, the most speciose yet least known genus of cetaceans. The amount of genetic diversity found within Mesoplodon is kind of ridiculous, particularly since we have no idea on how abundant, or non-abundant, all of these species are. Someone who really likes trying to find needles in haystacks (...in the ocean. ...this may be a bad metaphor) should invest in tracking down these populations and trying to ascertain their abundance. Top image from here. This write-up inspired by write-ups by thedodo.com and phys.org. No beaked whales were probably hurt in this write-up, but I'm not sure because they're so difficult to find unless they're rotting on the beach.